The Mouse, a.k.a. G359.23-0.82, gets its name from its appearance in radio images that show a compact snout, a bulbous body, and a remarkable long, narrow, tail that extends for about 55 light years (see radio image below). 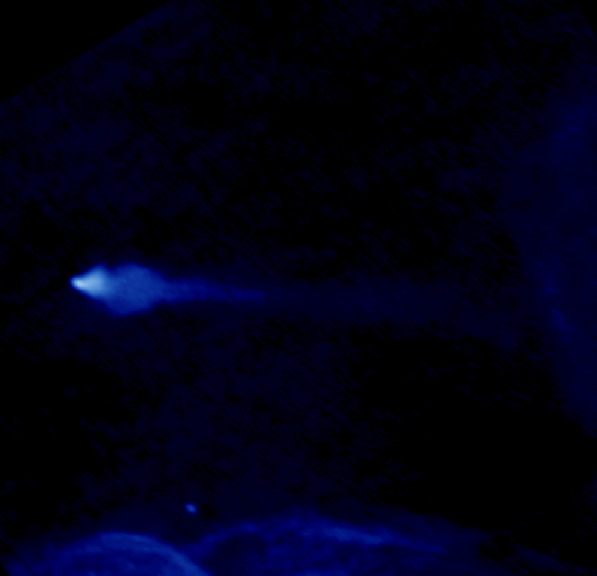 The image on the left, a composite X-ray (gold) and radio (blue), shows a close-up of the head of the Mouse where a shock wave has formed as the young pulsar plows supersonically through interstellar space. 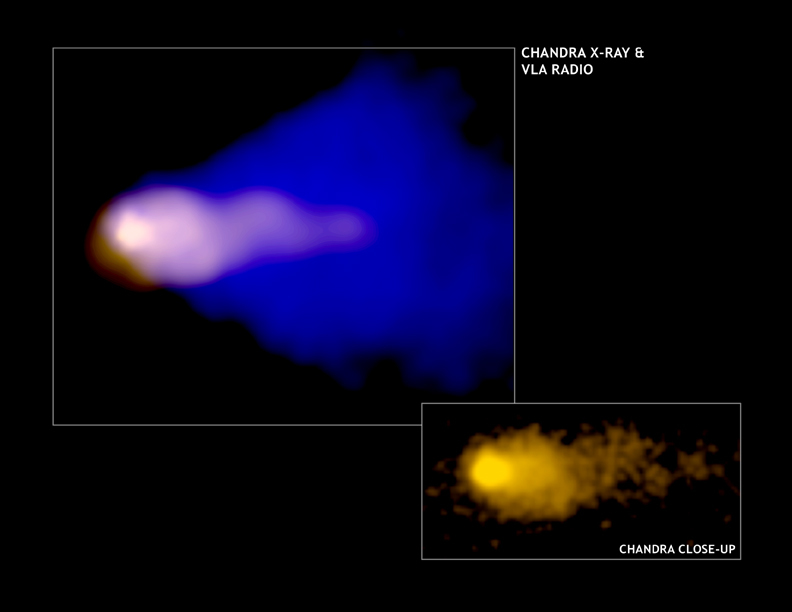 The X-ray cloud consists of high-energy particles swept back by the pulsar's interaction with the interstellar gas. Near the front of the cloud an intense X-ray source marks the location of the pulsar, estimated to be moving through space at about 1.3 million miles per hour. A cone-shaped cloud of less energetic, radio-wave-emitting particles envelopes the X-ray cloud. Pulsars are rapidly spinning, highly magnetized, neutron stars. Their formation is associated with the collapse and explosion of a massive star. Most pulsars get accelerated to a high speed by some mechanism - presumably related to the explosion - that is still unknown. Winds of high-energy particles from pulsars create large, magnetized clouds of high-energy particles called pulsar wind nebulas. A few dozen pulsar wind nebulas are known, including the spectacular Crab Nebula, but none have the Mouse's combination of relatively young age and incredibly rapid motion through interstellar space. In effect, it presents astronomers with a supersonic cosmic wind tunnel that they can use to estimate the speed of the pulsar and to study the effects of the pulsar's motion on its pulsar wind nebula. Scale Image is 1.2 arcmin across. Coordinates (J2000) RA 17h 47m 15.00s | Dec -29° 58' 01.00"